The 29-7 try scoring bonus point success not only secured the Irish Province’s place in next season Heineken European Champions Cup - it guarantees them a home quarter-final in the Guinness PRO14 play-offs next month. Tries from Jordi Murphy, Robert Baloucoune, Rob Lyttle and Billy Burns secured the bonus-point win which, combined with Benetton losing to Munster, means Ulster will finish second in Conference B behind Leinster. 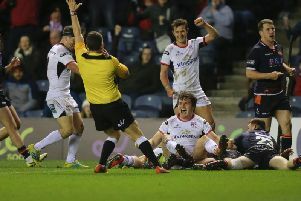 Ulster had produced a disappointing performance Glasgow a week earlier , but they were transformed last night - particularly in the set piece - at they returned to Scotland and eliminated one of their main rivals in that race for second place. Henderson, who wore the captain’s armband in the absence of the injured Rory Best - who was with the travelling party - revealed their dominance and control of the game was as a result of knowing how dangerous Edinburgh can be. “It came as a result of a bit of fear of what Edinburgh can do,” he said. Henderson added: “We were not happy with our performance last week. Head coach Dan McFarland added: “It is a credit to the lads they left everything on the field there. “To come here, the home of the European Cup quarter-finalists and get a bonus point win is a testament to their efforts, it is fantastic!